Young volunteers for NextGen America are successfully registering Millennials at the Pima County College and UofA campuses in Tucson, working to increase the level of voting by this huge voter bloc. “If we get out the vote it will lead to more progressive wins. 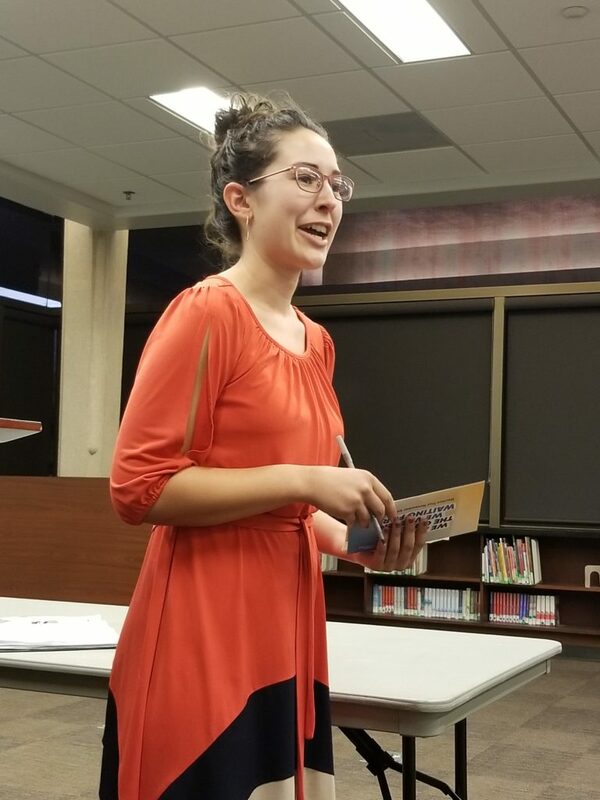 We need to increase the awful statistic of young people voting on an average of 23%,” said Maria Eller, a NextGen volunteer speaking at a recent Indivisible and Strong Meeting meeting. NextGen has registered 15,348 young voters nationwide since it hit the ground in the spring. For student welcome week in Tucson, the total voter registration at Pima Community College is 201 and at the UofA is 1,316. Statewide the organization is on over 23 college campuses. NextGen Rising aims to register, motivate, and turn out more than 250,000 young people to vote. Across 11 states, young voters will help progressives flip Congress, win Governor’s races, and take back state legislatures, according to its website. “We are the key to achieving progressive victories in 2018,” says the organization founded by Tom Steyer, a philanthropist, environmentalist, and liberal activist. Eller is an organizer at the Pima County College campuses downtown at 1255 N Stone Ave. and on the west side at 2202 W Anklam Rd. She works to start conversations with students from 10 am to 2 pm, and has a colleague who is working the UofA Campus. Eller is looking for other young people to volunteer. “Even though it seems hard, it’s not. We’re meeting them where they are, we are getting these voter registrations en masse and will work really hard to get them out to the polls. I really do believe we’ll see a difference in November,” she says. “No political parties or organizations have tried to reach out to us, we’re the first group to be having these conversations to go and vote,” Eller says. Some young people need an explanation about what registering to vote is. Others are skeptical and say, “I don’t believe in voting.” Eller says their rationale is that they are Libertarian and don’t want to be part of the system or are extremely disillusioned by the last presidential election. “They lack faith in the voting system,” she said. Some students don’t want the government to have their contact information, and they need to learn that it already has that data. People aged 18 to 35 years care more about issues than politics and political parties. Two issues that most resonate with Millennials are the cost of education and access to healthcare. NextGen volunteers follow up by text, as opposed to calling them. “We’re not the best at answering our phones,” she says. Accordingly, they organize digitally with Twitter, Facebook, and Instagram. Canvassing young voters can be tricky because they live in dorms and apartments, “or they are like me where I’ve moved to three different places in the last year and a half.” She still thinks canvassing is effective. Volunteers encourage Millennials to get on the permanent early voting lists, because they, like others, are so much more likely to vote as a result. Next articleIn order to preserve our Republic we need to have a well educated and engaged citizenry.